Jerry’s Rogue Jets was established in 1958. Three brothers Jerry, Alden, and Court Boice revolutionized commercial jet boating. They were the first install and use hydro-jet pumps in commercial passenger boats on the Rogue River. Jerry’s Rogue Jets became the first commercial jet boat tour company in the United States. Jerry’s set the standard for jet boat tours and continues today as a leading nature based tourist destination on the Southern Oregon Coast. Hydro-jet technology was important because it allowed boats to safely travel in just inches of water while carrying a full load of travelers. The Rogue River is notoriously shallow and rocky. With the advent of the hydro-jet no longer did components of the propulsion system protrude below the bottom of the boat. A hydro-jet draws water in through an intake with an impeller, mounted flush to the bottom of the boat, and then a propeller forces the water out through a nozzle mounted from the transom of the boat. The volume of water being projected from the boat is what gives the thrust forward. Steering is accomplished by directing the water nozzle to one side or the other. The hydro-jet was a major factor in revolutionizing jet boating on the Rogue River. Each of the brothers played an integral role in the development of their fledgling company. Jerry embodied the entrepreneurial spirit and must be acknowledged as the one who brought the idea of jet boat tours to life. It could be said that Jerry was a ‘jack of all trades’ serving as jet boat pilot, entertainer, tour guide, and recreational therapist. His wife Evelyn ran the office and took care of the daily bookings. Alden Boice was by trade a boat builder and mechanic. He built and maintained Jerry’s fleet of jet boats, at that time Jerry’s fleet consisted of 2 boats. The first boats were built from wood and had two engines coupled to hydro-jet pumps. Court, the oldest of the brothers, served as a jet boat pilot alongside his brother Jerry. Jerry, Alden, and Court Boice are considered the ‘Founding Father’s of Jerry’s Rogue Jets and commercial jet boat tours. 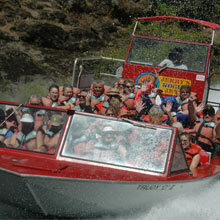 Jerry’s Rogue Jets set the standard for the jet boat tour industry. The Rogue River jet boat tour was designed as a careful blend of adventurous jet boating, nature based tourism, and unscripted educational/historical/comedic entertainment. Three distinct factors led to the success of their company; The addition of a public address (P.A.) system mounted on board the boat allowed Jerry and Court to weave tall tales and share the rich history of the Rogue River with their passengers; Alden built the fleet of new jet boats incorporating attributes of both performance and load carrying hull design. The new boat design and hydro-jet technology gave Jerry and Court the ability to create a more pleasurable and exciting jet boating experience; Most importantly, Jerry’s Rogue Jets operated for the sole purpose of introducing and entertaining travelers to the Rogue River. The goal of a commercial jet boat pilot on the Rogue River, then and now, is to instill the love and appreciation of this natural environment with each and every traveler. Jerry’s set the new standard for what it meant to take a jet boat trip on the Rogue River. In 1972 Jerry and Evelyn had operated Jerry’s for 14 years and realized it was time to retire from the jet boat tour business. They sold their interest in the company to Jerry’s brother Alden who partnered with a young Bill McNair. McNair grew up in Medford, OR and graduated from the University of Oregon. His family had a cabin 20 miles upriver and he had spent many summers along the Rogue River cementing his love of this fantastic environment. Fresh out of college he willingly accepted the opportunity to purchase half interest in Jerry’s Rogue Jets.